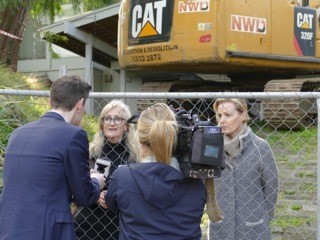 A crowd of around 25 locals and an ABC TV crew were on hand this morning to witness the demolition of the Chancellor and Patrick designed house at 27 Mariemont Avenue, Beaumaris. Tune into the ABC News tonight at 7pm as we’re hoping the story makes the bulletin. The demolition crew, to their credit, were good natured and respectful to protestors. We were permitted to take one last look inside. It’s devastating to see such a well-designed and built home be torn apart and sent to landfill. 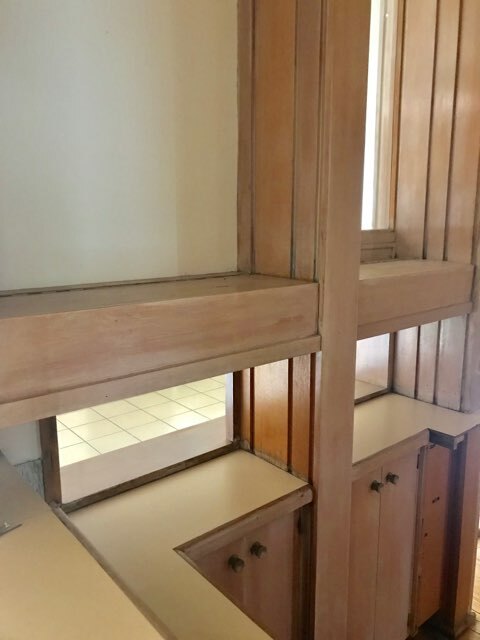 Unfortunately, Heritage Victoria said there was no time to submit an interim protection order, so unfortunately our eleventh-hour efforts to Bayside Council and the Minister for Planning were too late to save this remarkable piece of Beaumaris & Bayside heritage. 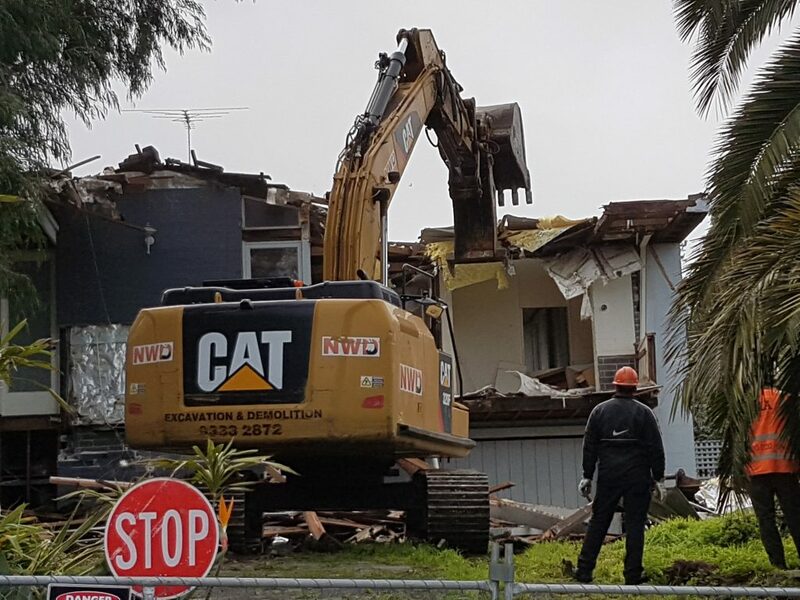 Building Surveyors granted a Demolition Permit in February which was lodged with Bayside Council. However, as the applicant has yet to lodge any Planning Permit, they were not required to advertise or advise neighbours in advance, nor was the Council required to make the permit details accessible on their website. A delegation from Beaumaris Modern met with Bayside Council Planning Managers on 18 May. 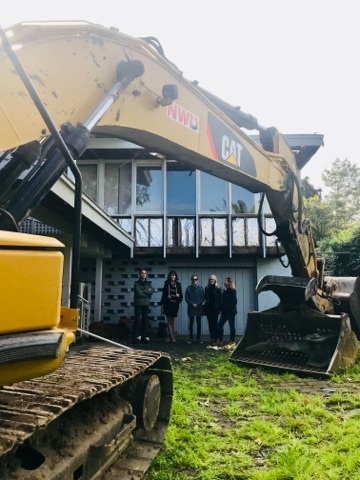 One of our questions to them was whether they could put significant, identified MCM houses such as 27 Mariemont on a “watch list” so the community could be advised of any demolition orders. Whilst verbally acknowledging “they will consider this”, their written response was that there is no such mechanism currently in place. We are now following up with a specific list of significant houses. 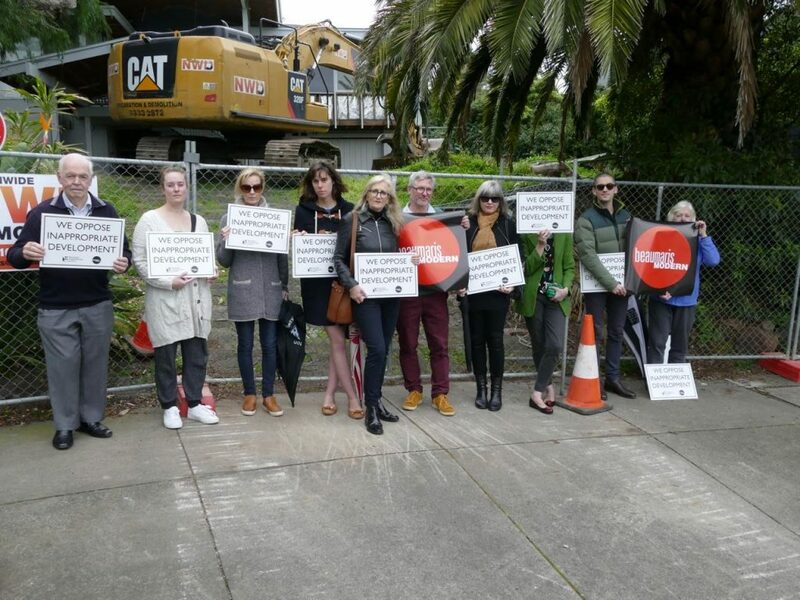 27 Mariemont may well have been spared its immediate journey to landfill had Bayside Council followed through on their own unsolicited request properly. This house, along with approximately 40 others, were cited in Council’s 2008 Inter-War & Post-War Heritage Study. 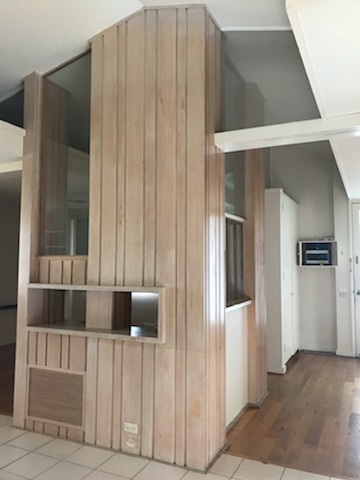 The Council at the time failed to continue with the heritage study and process, but in July 2017 following the release of their 2017 Heritage Action Plan, it was acknowledged that Mid-Century architecture had been ignored for too long and it was time to consider the heritage value of significant properties specifically in Beaumaris & Black Rock. Bayside Councillors not only voted unanimously to conduct an updated study but then specifically asked their Planners during the Council meeting if it was possible to apply an interim protection order on the houses identified in the 2008 study that were still in existence. The Councillors voted unanimously supporting a motion to seek interim protection from the Minister for Planning. Those in the gallery that night applauded this proactive approach by those Councillors. What occurred thereafter, that has led to the loss of this significant heritage asset, is local politics at its worst. Council had prepared a tender process for the study. Heritage consultants had applied. But Council did little to communicate to the community, and in particular did not adequately respond to objections and misleading information disseminated by a small, noisy bunch of residents. The same old dispursions about Heritage overlays were regurgitated – that it would lead to lower property prices; that owners would be unable to even make changes such as building front fences; that it would increase their costs to maintain the houses that elderly residents could not afford. There was even a dishonest conflation between Heritage Overlay and Neighbourhood Character, which are two completely different Planning amendments. Beaumaris Modern urged Council to communicate before the study commenced, but the only correspondance they sent was administrative and did little to address the misinformation that had been disseminated. The letter did however spell out Council’s heritage process in detail, with the various stages of public and home owner consultation. Then with only a few days warning, Council’s Urban Strategy department published a report to Council’s April meeting, which cited ambiguous and flimsy budget concerns and community disharmony as reasons to cancel the heritage study. Instead of presenting Council with the options to either continue as planned or completely scrap the heritage process, a third option was included – voluntary nomination. Council Planners have admitted that little research occured prior to them including this option in their report. They could find no previous example of this process being successfully deployed in Victoria. The voluntary nomination proposal was proposed to Council by the residents spreading the misinformation about Heritage. Council had already responded to public questions about a voluntary nomination process dismissing it as neither practical or a suitable mechanism ensure significant properties are nominated. Yet, on the 24th of April, the same Councillors who had voted unanimously just 9 months earlier in favour of an orthodox heritage process, backflipped to support this completely unscoped and unworkable proposal. And now another 3 months on, we are still waiting for Bayside Council to reveal how they will communicate, promote and execute the voluntary nomination process, and how it could possibly meet the objectives they laid out in their 2017 Heritage Action Plan. Therefore, we are working with the National Trust Victoria, Heritage Victoria and other like-minded bodies to ask the Minister for Planning to intervene to save what’s left of our unique local heritage. Please read our post regarding our efforts to save the Abraham’s House at 372 Beach Road, Beaumaris. Sign up to become a member or add your email at the bottom of the page to receive our subscriber newsletters.